Properties in Tampaksiring average 4.4 out of 5 stars. Property 55: Private pool 8*18 m. Promo price! Balinese villa in paddy fields nearby walking distance to Ubud center. Property 58: Balinese villa in paddy fields nearby walking distance to Ubud center. 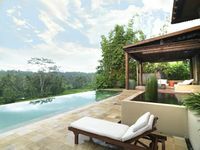 Property 80: Beautiful Villa for a Romantic Honeymoon or Family Getaway in Ubud, Bali. We had a wonderful visit at the NewMoon Villa. The open concept layout and generously sized sliding doors let the outdoor beauty into every room. The only sounds you will hear are nature and music from the nearby temples. The breakfasts cooked to order by the house staff made us feel very well cared for. While there are many insects, lizards, and frogs around the villa no one received any mosquito bites during our visit in the rainy season. Amazing! The villa exceeded all of our expectations. From the beautiful rooms, to the lovely hospitality, to the breathtaking pool and views, our family had a truly relaxing, yet immersive vacation at the villa. Don't miss the spectacular rice field walk into town (about 45mins with some rough patches) and do have Wayan cook up a Balinese feast for you one night you are there. Nothing about this place will disappoint. I will revisit it in my dreams. Thank you to all who made our stay very special!